The Australian newspaper is reporting in a pay-walled article that coral bleaching is a problem that goes back four centuries. 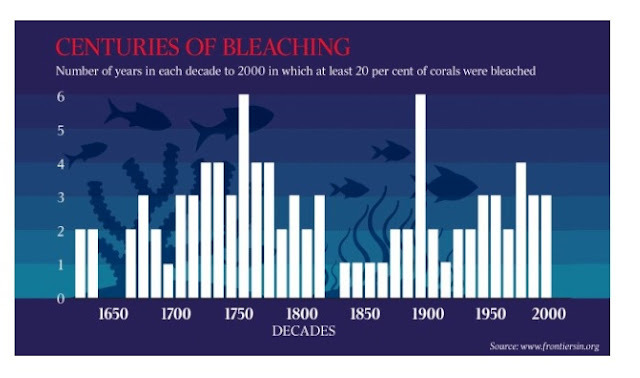 "A study of coral core ­samples has extended the known history of bleaching by more than 350 years but warns it is becoming more frequent and may be ­approaching a “tipping point” ­beyond which reef survival is ­uncertain. Published in Frontiers in Marine Science, the research by ­scientists from Glasgow and Edinburgh universities reconstructs temperature-induced bleaching patterns over 381 years spanning 1620-2001. The findings are at odds with claims that mass coral bleaching is a recent phenomenon due to climate change." The article claims that coral bleaching has been increasing since 1850 due to warming temperatures caused by human-induced global warming and that we are fast approaching a tipping point from which the GBR will not recover. Choosing 1850 as your starting point and then claiming that coral bleaching is increasing, is a classic case of false logic called cherry-picking. 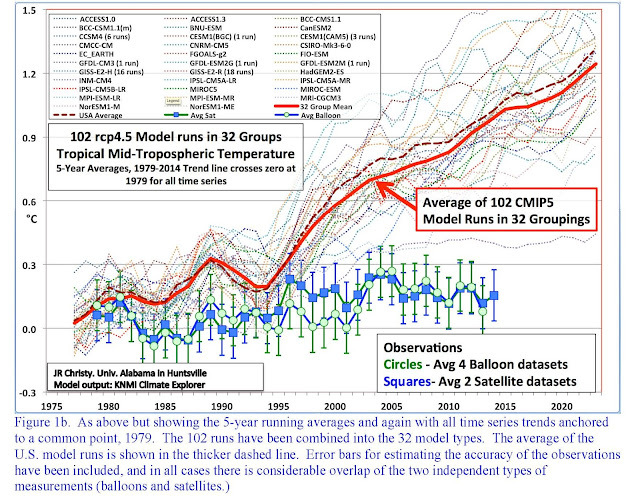 Looking at the data, I could just as easily claim that coral bleaching is controlled by the level of solar activity. There have been two periods in the last 400 years where the level of sunspot activity on the Sun has dramatically decreased. They are the Maunder minimum and the Dalton minimum. Both were associated with distinct periods of cooling in the world's mean ocean temperatures, with the Maunder minimum reaching its coolest temperatures in about 1660 and the Dalton minimum in 1820. This matches the observed minimums in coral bleaching observed around these same dates. If the world's mean ocean temperatures are in fact affected by the level of sunspot activity, then we should expect the level of coral bleaching to decrease between about 2020 and 2050, matching the expected decrease in solar activity. You need to be careful they use a Mann et al. (2008) temperature reconstruction, which should be taken with a truck load of salt.